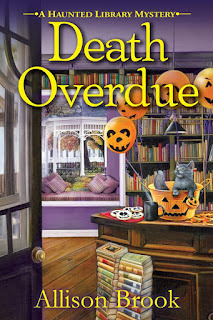 Oh how I love a good cozy mystery especially one that has a library and it haunted. This book has all the makings for the start of a good new series. You have two mysteries to solve in this book. The fifteen year old one of Laura Foster and the most recent one of Al. I think Al was done in as he had figured out what happened to Laura. Then Carrie starts looking into the murder and now she needs to watch her back. I liked the twists the author put in the story two keep you interested. The only negative that I would have to say about this book is that I would have liked more of the ghost. But that was not enough to keep me from enjoying this book and looking forward to the next book in the series. This is the perfect book to read this time of year. Thank you for hosting me today and for your review of DEATH OVERDUE.